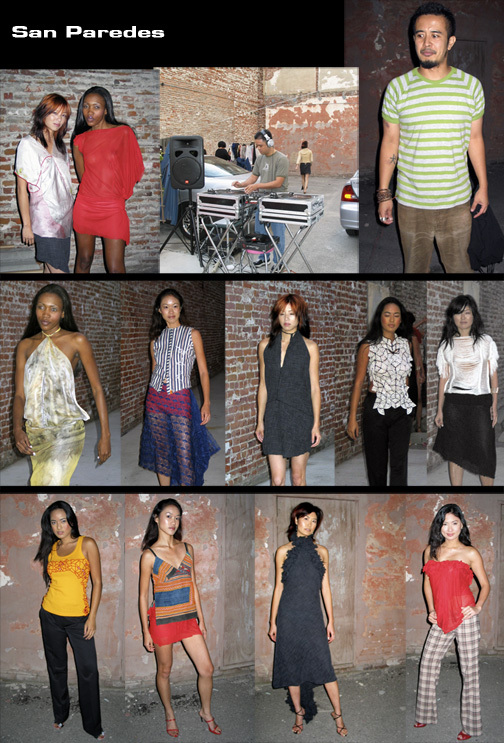 As in seasons past, designer Paul Magdalad kicked off Fashion Week with an unlisted program of his own, held in Chinatown. This time restaurateurs from Asian Noodles played host, creating an impromptu runway in their parking lot and serving snacks to waiting editors, friends and fashionistas from their fusion menu. With washlines hanging overhead and local onlookers poised along the chainlink fence, models took their turns in tie-dye chiffon dresses, deconstructed menswear separates and handkerchief linens with the designer's signature frayed edges, twisted fabric rosettes and asymmetrical hemlines. Like haiku poetry, this collection was powerful in its brevity, articulating beautiful, commercially viable ideas worthy of distribution to every Nordstrom and Bloomingdales across the country. Pity most of these pieces will be special order items only. A modest turnout of loyal supporters and press, including TV personality Huell Howser, was on hand to cover the event. Once again, this renegade designer presented his capsule collection of deconstructed street-inspired couture in a tone and setting that was both refreshing and plausible. Copyright © 1999-2004 Apparel Search Company. All Rights Reserved.